'Good to be back in weightlessness,' wrote JAXA astronaut Soichi Noguchi on Twitter concerning this scuba dive at the Aquarius underwater laboratory. Noguchi was on the SEATEST crew that worked in the lab in September 2013. While taking a break from spacewalk practice on Thursday (Sept. 12), an astronaut consulted a checklist of activities only to be visited by ... a large fish? Such is the daily life for an international team of astronauts working on the ocean floor at the Aquarius undersea laboratory in Florida. The astronauts, who represent the United States, Europe and Japan, are hard at work Space Environment Analog for Testing EVA Systems and Training (SEATEST) mission. Preparations for the five-day space simulation began Monday (Sept. 9) and aims to test procedures related to spacewalks, training and team communication for space. 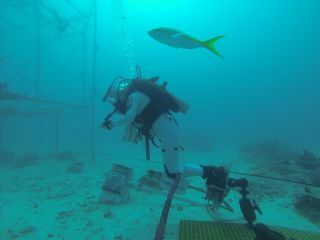 JAXA astronaut Soichi Noguchi in the Aquarius underwater laboratory, with a barracuda in the background. Noguchi was on the SEATEST crew that worked in the lab in September 2013. "It also has a hydrate station where we can brush our teeth," said Andreas Morgansen, an astronaut with the European Space Agency, in a video tour of the Aquarius habitat. The video showed a small school of fish in a window behind the small "station", which included a sink. "Most importantly, [we have] our comms station where we can talk with the divers when we're out on EVA, and with the Mission Control center topside." Aquarius – the only permanent underwater scientific research facility in the world – has been conducting operations for the better part of two decades, including 16 NASA Extreme Environment Mission Operations (NEEMO) missions. The latest took place in September 2012, when astronauts simulated a mission to an asteroid. As of late last year, Aquarius was expected to close due to budget cuts at the National Oceanic and Atmospheric Administration (NOAA), which owns the lab. Florida International University agreed to take over operations in January, providing a reprieve. SEATEST mission preparation work began Monday, a day later than planned, because of a cooling problem inside of the habitat, Morgansen wrote on Twitter. NASA astronaut Kate Rubins just before diving into the water en route to the Aquarius underwater laboratory. Rubins was on the SEATEST aquanaut crew that worked in the lab in September 2013. Since then, in between crew "spacewalks" using flippers and tanks instead of spacesuits, the astronauts have been tweeting updates showing the food they eat, the computer equipment they use, and even fish outside of the window. "We have finished Day 2," wrote NASA astronaut Joseph Acaba, who is commanding the mission, on Twitter Wednesday (Sept. 11). "Completed all EVA objectives and got in a little workout trying out a new miniature exercise device." You can follow the Aquarius activities live through this video link or through the astronauts' Twitter accounts: Joseph Acaba (@Astro_Acaba), Andreas Morgansen (@astro_andreas), Soichi Noguchi (@Astro_Soichi), Thomas Pesquet (@Thom_astro) and Kate Rubins (@Astro_Kate7).